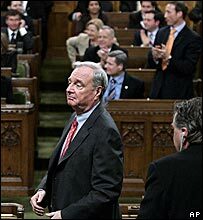 Canadian Prime Minister Paul Martin's government has been ousted in a no-confidence vote. Canada's three opposition parties united against his Liberal Party, which has been mired in a corruption scandal. Mr Martin will seek the dissolution of parliament on Tuesday, and a date for a general election - thought likely to be 16 or 23 January. Recent polls suggest Mr Martin's Liberals will take most votes in the election - but will not win a majority. In parliament on Monday evening the opposition voted by 171-133 to bring down Mr Martin's government. 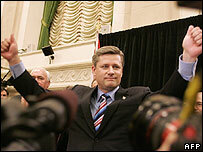 "This has been an historic evening," said opposition Conservative leader Stephen Harper. "This is not just the end of a tired directionless scandal-plagued government. It's the start of a bright new future for this great country." Mr Martin insisted his party would win the election. He said he would visit Governor General Michaelle Jean on Tuesday to ask her to dissolve parliament, after which the election date would be announced. The Liberals denounced such "false smears" and threatened to sue. In the most recent polls the Liberals score about 36%, against 31% for the Conservatives, suggesting the Liberals - in power since1993 - will have to govern with the help of opposition parties. The Liberals say they will campaign on their economic record, having wiped out a huge budget deficit, and seen the economy boom and unemployment fall. "We are entering this campaign with a strong balance sheet and we can be proud of it," Mr Martin said after losing the vote. "Our economy is a strong one with the lowest rate of unemployment in Canada for the past 30 years," he said.